Friends English Preschool was established in April 2014. As of March 2015, we have fifteen students enrolled. Our main teacher is Ms. Jeungli. Every day children enjoy singing, dancing, and playing during Circle Time led by Ms. Jeungli. When the weather is nice, the preschoolers love to go outside and play under the big tree that shades the playground. In this picture you can see Ms. Jeungli and the Friends English Preschoolers with a sign made from acorns the children collected. 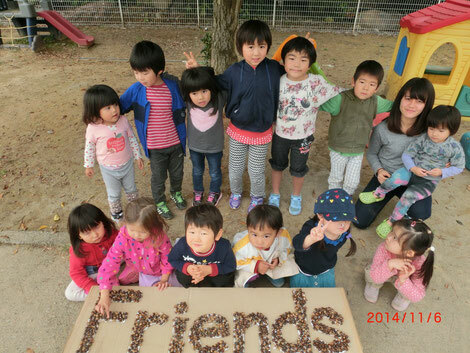 Friends English Preschool is recognized by the education administration of Japan. Our holidays are Saturdays, Sundays, and Japanese national holidays. The monthly fee to join our preschool is ¥37,500. If you wish, you can reserve a time to come observe the preschool for free! If you're interested, we invite you come by and join the fun!